My dear blogging friend Melanie, from the blog Finchnwren, has begun a new series on her blog this year and it has been so much fun to follow! 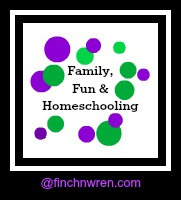 Family, Fun and Homeschooling consists of a series of interviews of homeschooling moms! Each Friday you'll meet a new family and take a peek into their world. So many homeschooling styles, families and methods exist. It is wonderful to learn how each family implements schooling into their lifestyle or home! Last Friday, her interview featured me. What an honor! Feel free to head over to her blog and read the interview in full. You also can subscribe to her blog and be certain not to miss any of these fun interviews! Finchnwren: Tell us about your blog. How did you come up with Thrift Schooling? Me: When my kids were little, ages three, two and newborn, I would constantly be at home. Someone was always napping or nursing and it was just easier to be at home. With all the demands of taking care of these little ones.... READ MORE AT FINCHNWREN!